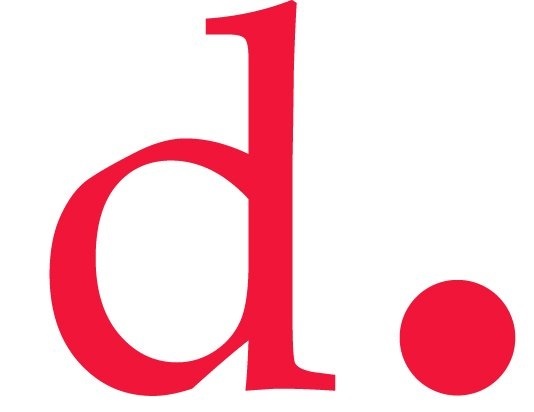 Through a partnership between the District Department of Transportation, DC Surface Transit, Inc. and National Park Service, DC Circulator will become the exclusive public transit system to provide visitors, commuters and residents door-to-door transportation to more than 20 museums, memorials and monuments along the National Mall. The new route will integrate 13 brand new buses beginning at Union Station, traveling along Louisiana Avenue and looping around the Mall via Madison Drive, Constitution Avenue, West Basin Drive, Ohio Drive and Jefferson Drive. 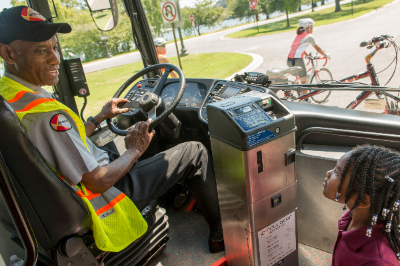 For only $1, riders who pay with a SmarTrip™ card have a two-hour window of unlimited boarding and exiting on the Circulator as it travels to sites along the mall. For more detailed information on the new National Mall route including a map, fact sheet and photos, visit the official website: www.nationalmall.dccirculator.com. 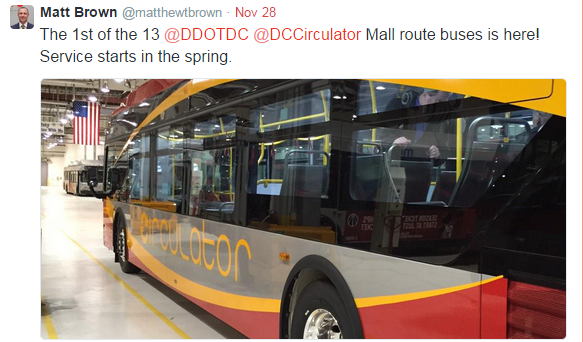 The year 2015 marks one decade that the Circulator has been providing you quality transportation to DC’s primary neighborhoods. 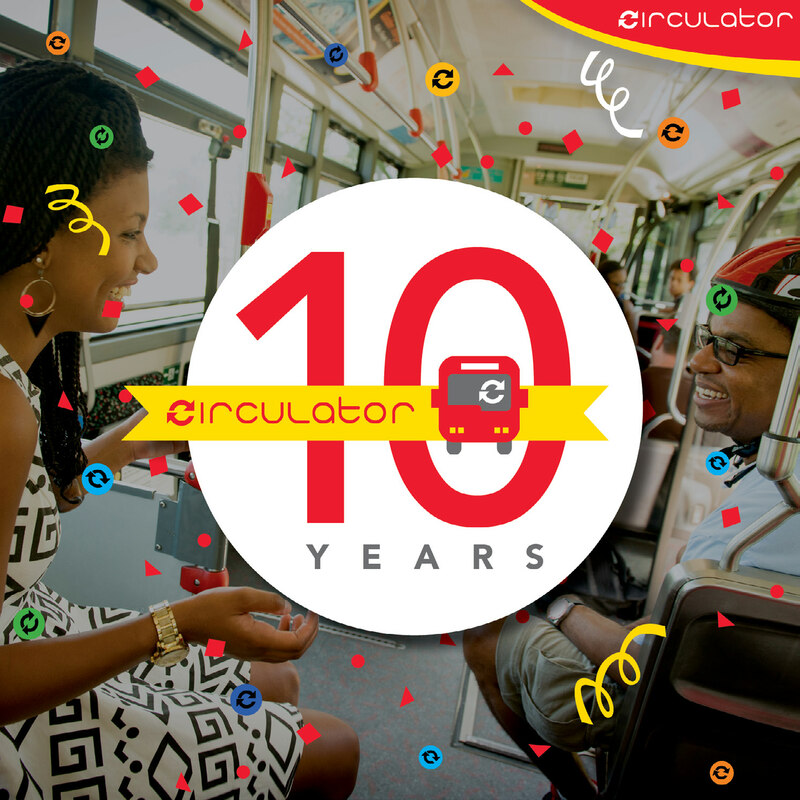 With 13 brand new buses, to a new route along the National Mall, and so much more, we are celebrating 10 years of Circulator in big ways. And we want you along for the ride! 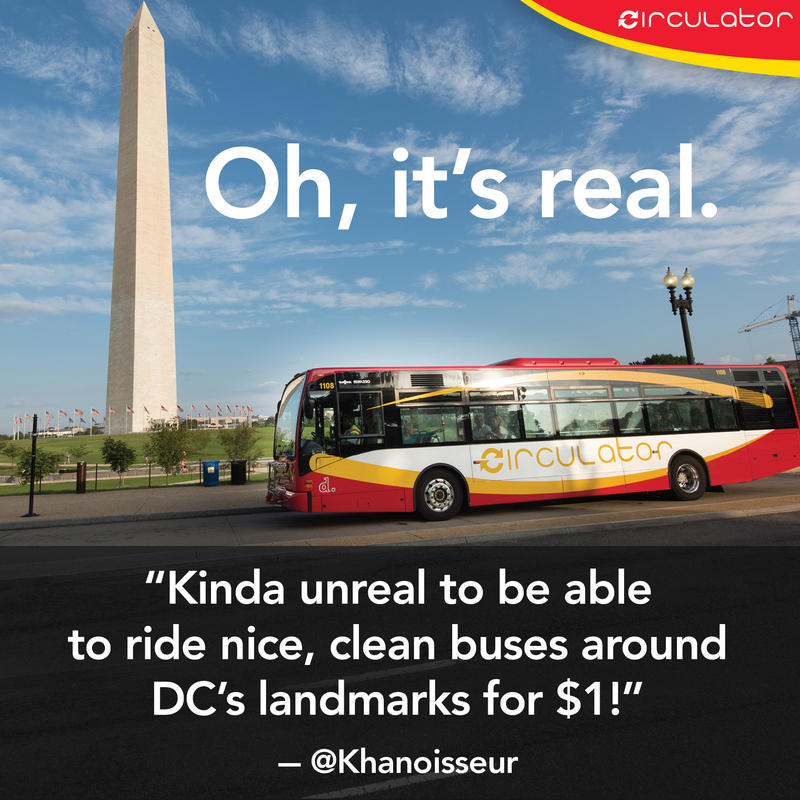 Stay connected with us by following DC Circulator on Twitter and liking our Facebook page so that you never miss a Circulator celebration. 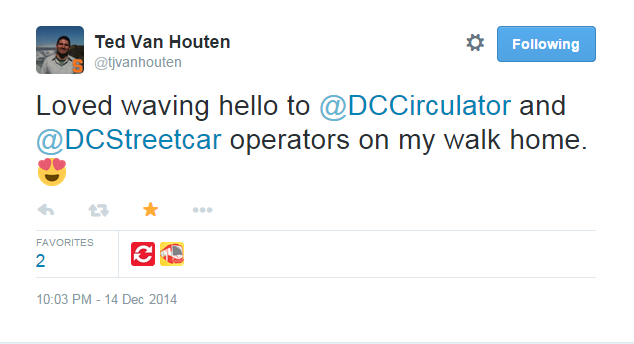 To look back at the history and growth of the system, visit the “about us” section at www.DCCirculator.com. Mr. Moore, from Southhill, Virginia, has 41 years of commercial driving experience, with six years as a beloved Circulator operator. He boasts an accident free driving record and is known for always welcoming boarding riders with a big smile. Mr. Moore enjoys driving on all Circulator lines, but you'll most likely encounter his safe driving and pleasant personality when you hop on the Union Station to Georgetown route. 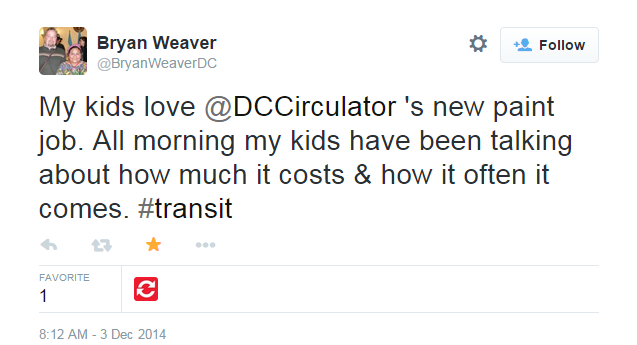 If you see Mr. Moore on your next Circulator ride, be sure to say hello! Look forward to more accurate bus arrival times on our Nextbus page and on applications like RideDC. Beginning in February, Circulator buses will be equipped with new smartphones that will provide continuous, real-time tracking data to mobile apps. Arrival predictions will soon be updated as often as every 30 seconds rather than every three minutes. 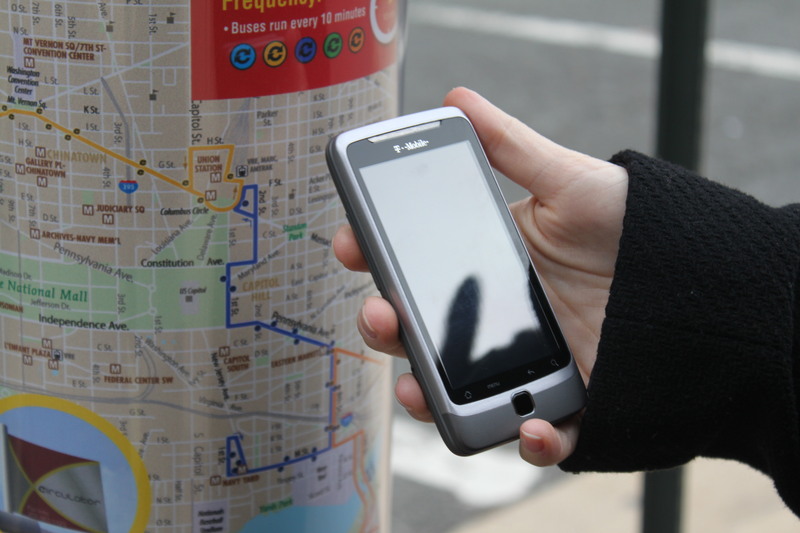 In his article "How Smartphones Improved Real-Time Bus Tracking in DC," Jake Williams details the new system, how it was developed and how it works for you, on statescoop.com. Spectrum Theatre: 1611 North Kent St. This new pizzeria in Golden Triangle describes itself as a "cool, modern storefront where diners customize their pies and wait just a few minutes to chow down." Take the Georgetown - Union Station route to 19th & K Streets NW and head North. Help us keep bus floors as dry as possible to avoid slipping. Kick the snow off of your shoes and shake off your umbrella before boarding. Use the hand rails for extra caution. 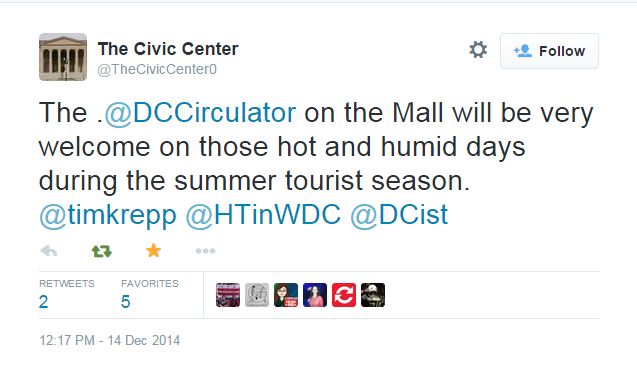 During inclement weather, Circulator service is adjusted based on road conditions. Major service changes are announced on our website and real-time updates are posted on our Twitter page.